Has your child had a recent vision screening? 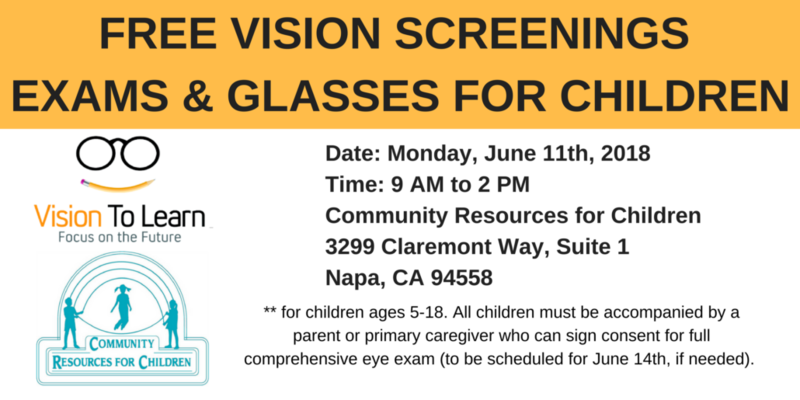 Community Resources for Children is partnering with Vision to Learn to deliver FREE screenings and comprehensive eye exams and glasses (if needed) to children ages 5-18. *Parents/primary caregivers must be present to sign consent for a full exam (if needed). Exam date for children who need a comprehensive eye exam: June 14th. 40th Annual A Day in the Park was a success! Story Time at the Napa Farmers Market All Summer Long!